FIRM Department of Architecture Co.
A beguiling mash-up of art deco and International Style architecture, completed in 1940, the Grand Postal Building is now home to a much more recent government entity. And it’s a newcomer with a mission—to nurture and advance the country’s creative businesses by providing a broad range of resources and services. Now they all occupy the five-story building, transformed by principals Amata Luphaiboon and Twitee Vajrabhaya. Thailand Creative & Design Center by Department of Architecture Co. in Bangkok, Thailand. Photography by W Workspace. Along with offices, coworking spaces, seminar rooms, workshops, and two multipurpose spaces that often host exhibitions, the center’s main components are two libraries. One consists of samples curated by none other than Interior Design sister company Material ConneXion. Design books can be found in the other, a 5,000-square-foot clear glass box at the top. The latter’s massive yet ethereal volume exemplifies Luphaiboon and Vajrabhaya’s approach to the whole project: New architectural elements are treated as objects added to an existing structure while retaining its distinctive mid-century character. 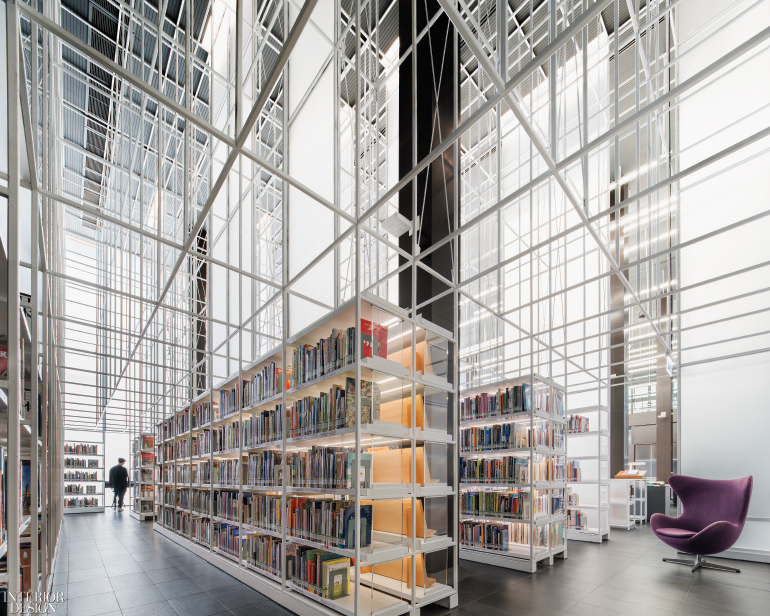 Inside the library, books sit on open shelving in white powder-coated steel inset with translucent acrylic panels. The white frames then rise 30 feet, as an empty grid, passing through the ceiling’s painted acoustical panels to meet the roof’s steel structure. Translucent materials and clean, unfussy forms imbue the intervention with a glowing quality that complements the weighty historic shell. Inspiring such design-based dialogue is the center’s mission, after all. Project Team: Peerapat Singkalvanich; Pentad Somjaidee; Komkrich Thonglaem; Tanasab Apiwannarat; Worrawit Leangweeradech; Tanapat Phanlert; Phasit Rattanachaisit; T-Mah Chaivuthigornvanit.